Some saints’ names are far more familiar to us than others, but even the lives of obscure holy persons teach us something. 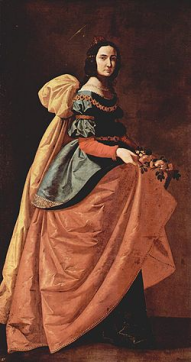 And so it is with St. Casilda, the daughter of a Muslim leader in Toledo, Spain, in the 10th century. Casilda was herself raised as a Muslim and showed special kindness to Christian prisoners. She became ill as a young woman but was not convinced that any of the local Arab doctors could cure her. So, she made a pilgrimage to the shrine of San Vicenzo in northern Spain. Like so many other people who made their way there—many of them suffering from hemorrhages—Casilda sought the healing waters of the shrine. We’re uncertain what brought her to the shrine, but we do know that she left it relieved of illness. Tensions between Muslims and Christians have often existed throughout history, sometimes resulting in bloody conflict. Through her quiet, simple life Casilda served her Creator—first in one faith, then another.